Played by Montgomery Clift in the 1958 film, Noah Ackerman was a young Jew from the Bronx forced to deal with anti-Semitism coming from the enemy — but also in his own ranks. In a very emotional ending scene, Ackerman was forced to confront the horrors of the Holocaust as his company liberates a Nazi death camp. Added bonus: The movie also features Marlon Brando and Dean Martin. Find out who the rest are after the jump. Long Island pretty girl Judy Benjamin (Goldie Hawn) was the ultimate JAP, and she could have stayed that way had her husband survived their wedding night. Alas, as Benjamin tried to get her life together, she fell victim to a sneaky recruiting sergeant who convinced her to join the U.S. Army. From that moment on in this 1980 comedy, Private Benjamin was, well, what you’d expect: a princess-turned-soldier (with just a dab of princess). The semi-autobiographical story by Neil Simon tells the coming-of-age story of a young, nebeshy Jewish kid from Brooklyn. Unfortunately, since it takes place in the 1940s, it coincides with World War II, and so, Private Eugene Morris Jerome (Matthew Broderick) is forced to experience some serious growing up, as he trains to become a soldier in an army base in Biloxi, Miss. Among other things, he has to deal with an eccentric drill sergeant (Christopher Walken), Southern anti-Semitism from fellow soldiers, a Jewish best friend, and, of course, discovering the one thing that is worth dying for — women. 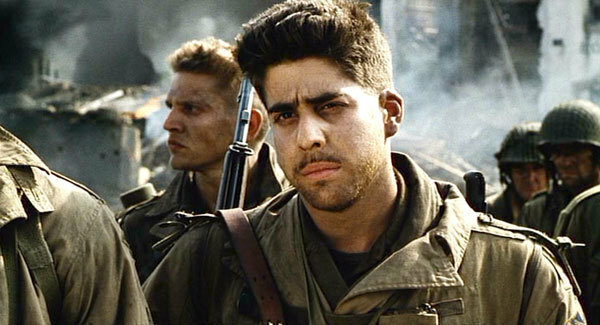 There is something likable about Mellish (Adam Goldberg) in Steven Spielberg’s 1998 brutal masterpiece. Maybe it’s the neurosis, or his sense of humor (we liked the one about turning a HitlerYouth knife into a challah cutter). However, Mellish is mostly remembered for a very specific, hard to watch scene (click here to see it for yourself). In the scene below, Mellish explains to Private Ryan (Matt Damon) which Company C soldiers were killed during the mission to bring him home. 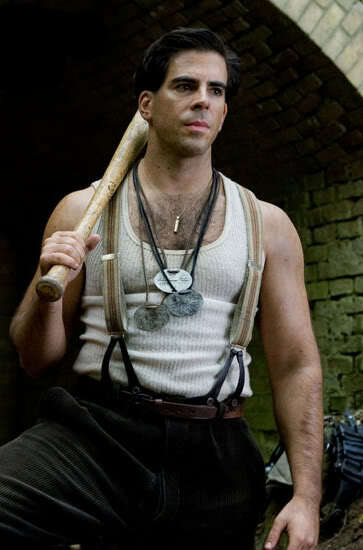 If Tarantino’s film about American Jewish soldiers whose sole mission is to hunt Nazis is a fantasy island, “The Bear Jew” (Eli Roth) is King Kong. Staff Sergeant Donowitz was famous for being absolutely ruthless with his Nazi prey and is known for some grody scenes. More Goliath than David, this superhero of a Jew took the misfit image of a Jewish soldier and smashed it in the head with a baseball bat.